ALL ABOARD FOR THE GRAND OPENING OF THE 2013 MACY’S PINK PIG AT LENOX SQUARE! 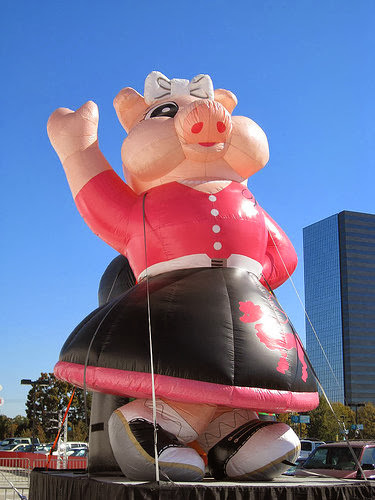 ATLANTANS OF ALL AGES ARE INVITED TO RIDE PRISCILLA THE PINK PIG INTO THE HOLIDAY SEASON! WHAT: Atlanta’s most unique and beloved tradition launches the holiday season with the 2013 Macy’s pink pig. join us on Saturday, nov. 2 for our grand opening day celebration and ribbon cutting ceremony. Priscilla the Pink Pig will once again carry children of all ages through a life-sized storybook filled with friends and fun beneath the signature 170-foot, 1950’s-themed pink pig tent. The ride officially opens to the public on Saturday, Nov. 2, 2013 and will remain open through Sunday, Jan. 5, 2014. each ride costs $3 and repeat rides have a special discounted price (2 rides for $5.50, 3 rides for $7.50). true to tradition, a portion of the proceeds from each ride will benefit Children’s Healthcare of Atlanta. The ride is closed thanksgiving day and Christmas day. for the full schedule including hours of operation, please visitwww.macys.com/pinkpig. SPECIAL NOTE: On grand opening day only, kids can bring a dvd and receive a complimentary ride. All dvds will be donated to Children’s Healthcare of Atlanta hospitals. Dvds can be new or used, rated g or pg. MORE: The Macy’s Pink Pig has been a beloved Atlanta tradition for more than 50 years. From its debut in the ‘50s as a children’s ride at the downtown rich’s store, to its brief stint at the Egleston Children’s Hospital festival of trees, five generations of Atlantans have ridden the Macy’s pink pig into the holiday season. 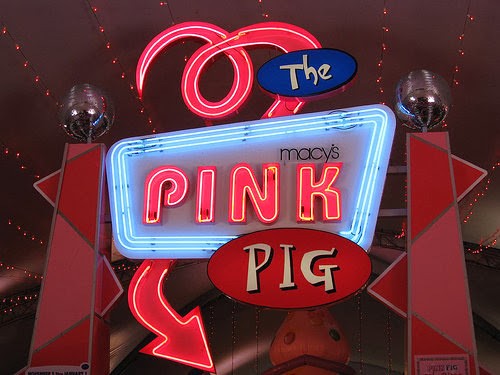 Priscilla – The Original Pink Pig – began as a monorail along the ceiling of rich’s, giving children the experience of “flying over” the toy department. Later, another pig – Percival – was added and they became known as the pink pig monorail twins. Years later, the monorail was relocated to the roof of the department store and the monorail twins took passengers on rooftop rides viewing downtown atlanta and circling the great tree. In 2003, Priscilla the pink pig was re-introduced to a new generation of Atlantans. Since then, she has been back on track beneath a 170-foot, 1950’s-themed pink pig tent at the Lenox Square Mall upper-level parking deck near Macy’s. Atlanta’s most “pink-tacular” train ride travels along train tracks to carry children and parents through a life-sized storybook that includes the original pink pig and other holiday friends. Once again, a portion of the proceeds from each ride will benefit the children’s healthcare of Atlanta. To date, macy’s has donated more than $470,000 to Children’s Healthcare of Atlanta. I can't wait to see Macy's Pink Pig! It's a holiday tradition for our kids. Are you ready to ride? For a complete list of the Pink Pig's schedule, click here!